“Don’t just leave it the way it is; make it grow,” argued former Task Force chair Martin Obsorn. Santa Barbara’s fiscally imperiled Rental Housing Mediation Task Force is far from out of the woods, but based on this week’s council meeting, it appears to have more room with which to work. The good news for the Task Force, which has been mediating disputes between landlords and tenants (and often between tenants and tenants) in Santa Barbara for the past 35 years, is that its six-month lease on life — provided by the City Council last summer — has now been extended to a full year. The bad news is that the same forces that put the Rental Task Force behind the financial eight ball — federal cuts to the Community Development Block Grant program — are still in effect and threaten only to get worse. In the face of those federal cuts, last year, city administrators proposed cutting the program — which serves about 1,000 people a year, mostly low-income — so deeply it would effectively eliminate mediation services from the Mediation Task Force. Instead, the organization would be reduced to providing information to landlords and tenants inquiring about their respective rights and responsibilities. That effort sparked an outpouring of vocal support for one of the few City Hall programs to target the 60 percent of Santa Barbarans who rent. In response, the City Council voted — for the first time in the agency’s 35 years — to make up the difference by dipping into the general fund to the tune of $36,000 for a six-month period. That general fund “subsidy” expires at the end of December. Thanks to an infusion of cash from Carpinteria, Goleta, and the County of Santa Barbara — not to mention $10,000 in grants — the Task Force (whose mediation services have benefited the family of this writer) now has enough money to make it through June. But come July 1, the Task Force will confront a projected shortfall of $71,000, and it will be up to the City Council — once again — to determine whether to put a program that historically never received general-fund dollars on the general-fund payroll. With the election of Cathy Murillo to the City Council — she takes office in January — the Task Force has found a likely new supporter to join Mayor Helene Schneider and Councilmember Grant House. Councilmembers Bendy White and Frank Hotchkiss, while appreciative of the work the Task Force does, expressed concern about saddling City Hall with any new obligations. And Councilmember Dale Francisco asked a lot of questions that indicated a strong interest in transferring the Task Force’s function to some nonprofit agency. 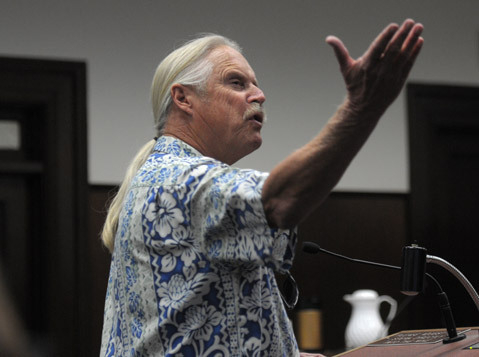 Geoff Green from the Fund for Santa Barbara — which just provided the Task Force with a $5,000 grant — urged the council to keep the Rental Task Force under City Hall’s auspices. No other nonprofit currently provides the services the Task Force does, he said, and none could do the job as efficiently. Aside from the fact that the Task Force’s initials do not spell out a “cute acronym,” Green asked, “What’s not to like?” Lisa Beck, a volunteer mediator, argued that for the Task Force to remain effective it had to enjoy a reputation of neutrality with both landlords and tenants. Such neutrality would be seriously compromised, she argued, should the Task Force be joined with a nonprofit organization affiliated with tenants’ rights or with landlord concerns. Beck said the Task Force explored a host of other changes that might cut costs, like charging beneficiaries a fee for service based on a sliding scale. Because 80 percent of the clients are of decidedly limited means, she said, this would chase many potential clients away. Should that happen, she argued, landlord-tenant disputes would spill over into an already overloaded court system, or cops would find themselves forced to deal with the unhappy fallout from people attempting to settle disputes on their own.